Asia secunda pars terrae in forma Pegasi. [Asia is presented as the mythical winged horse Pegasus.] 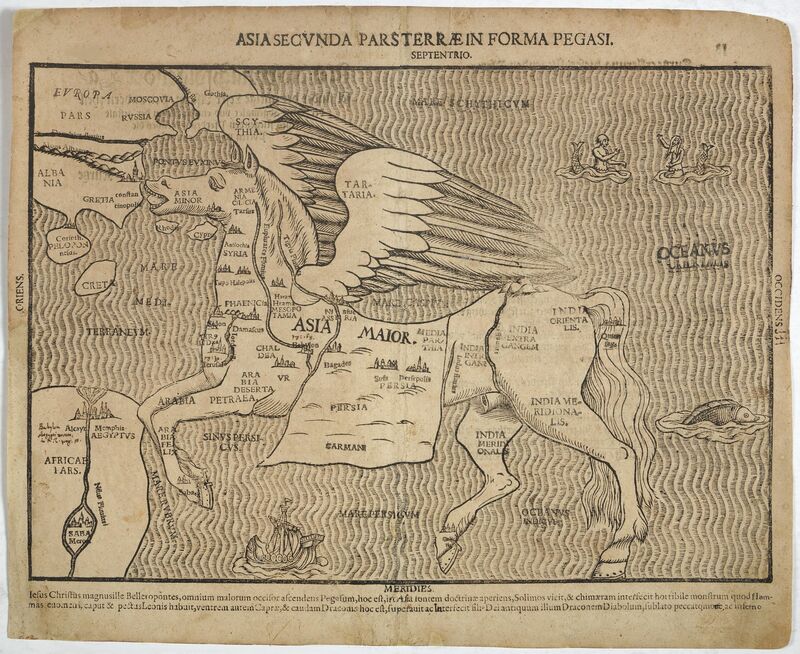 - BÜNTING, H.
Title : Asia secunda pars terrae in forma Pegasi. [Asia is presented as the mythical winged horse Pegasus.]. Date : Magdeburg, c. 1581. Bünting's work Itinerarium Sacrae Scriptura.. was essentially a theological commentary with other maps of great curiosity. - The wings are labelled Scythia and Tartaria, names often used to describe the vast unknown areas of Siberia. Condition : Paper is age toned. Repair of tear lower part center fold, hardly notable. Else good condition. Latin text on verso.